Father's Day is just a matter of days away and is creeping up on us fast. This year, like most years the day has fallen on Nick's birthday too which means he'll receive two sets of presents! I struggle buying gifts for him at the best of times nevermind when he has two events to celebrate! With this in mind, I've put together a post of all the items that he'll be receiving this year and a couple that will be great for my Dad! Hopefully, it'll give you some ideas if you still need to grab a couple of last minute gifts. If I ever need a little inspiration when it comes to buying gifts then I tend to head over to Buy A Gift. Not only have they got thousands of experience days but they have spa days, hampers and gifts too. 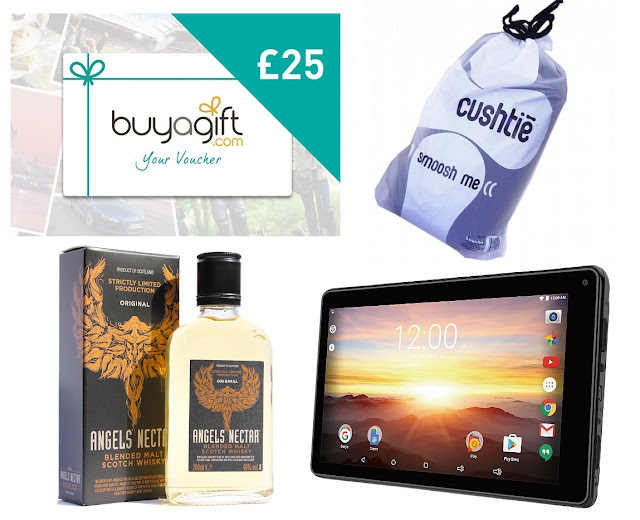 If you are unsure about what to book then there's the option to purchase Buy A Gift vouchers which gives the recipient the option to spend it however they like. Cushtie's are lightweight and compact so can easily be taken in the car or packed in your hand luggage if you're going on an aeroplane. We like to travel and have recently just come back from a holiday to Majorca. With this in mind, I like to look out for presents which would benefit us when travelling, especially to a different country. Nick doesn't like flying so the Cushtie Pillow from Find Me A Gift would make him a bit more comfortable and the kids would be able to use it too. They look so comfortable that we'll probably use it around the house too. Angels' Nectar Blended Malt Scotch Whisky has been carefully created from a selection of Speyside and Highland malt whiskies and bottled at 40% Vol. It's smooth and sweet with hints of apple pie on the nose, followed by heather honey and lemon on the taste. My Dad hasn't tried this brand before and I know he'll be delighted when he unwraps it on Father's Day. This is another gift which is perfect for travelling or for home use. The Mercury 7L operates on Android 6.0 and has a seven-inch capacitive touchscreen with a display resolution of 1024 x 600. Inside the Mercury 7L is a Quad Core 1.3Ghz processor with 1GB RAM, 8GB of internal memory and built-in Wi-Fi capability, making it a great option to surf the internet. The Mercury 7L has a front-facing 1-megapixel camera, ideal for video calling friends and family or for taking selfies. With a Micro SD card slot and Micro USB port for data transfer and charging, this great value tablet is the perfect option for kids or when travelling. This classic cut tie is made from a smart dupion fabric. Suitable for any formal occasion, it has been custom made to ensure the perfect match with our waistcoat range. It's available online at Dobell and comes in a range of different colours. 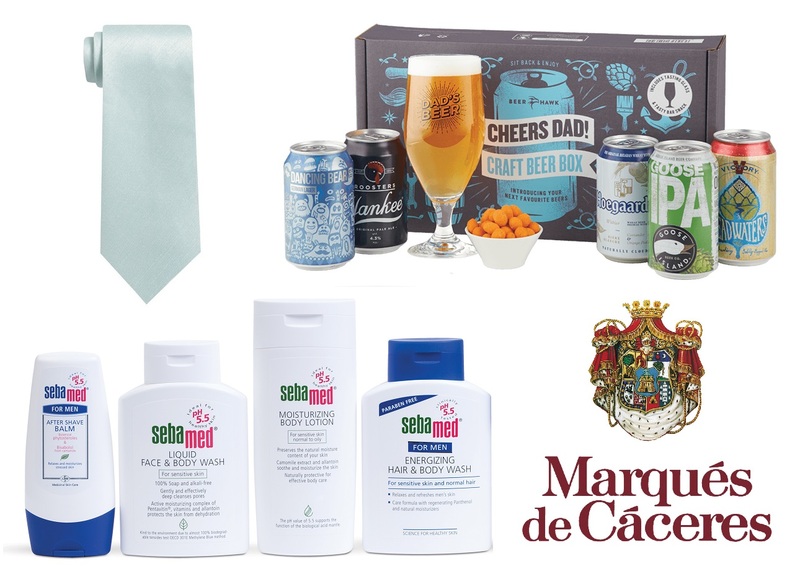 This Father’s Day Beer Hawk, the UK’s leading online craft and speciality beer retailer, is throwing out the socks and slippers and replacing them in favour of beer! The ‘Cheers Dad’ craft beer gift box promises five great beers from around the world, a limited edition ‘Dad’s Beer’ glass and a tasty bar snack. Cheers Dad has been carefully curated by Beer Hawk’s in-house beer experts to make it the perfect gift for beer-loving dads this Father’s Day. I now have this hidden away for Father's Day and I'm so excited to surprise Nick with it, he'll love it! Nick is always neglecting his skin and as he's getting older it's time to start paying attention to it. The Sebamed For Men bundle covers all the products you require for good healthy skincare. It includes a cleanser, moisturizer, shaving balm, body wash and even a deodorant. Created with the same pH 5.5 value as healthy skin, it supports and protects the natural barrier function of the skin’s acid mantle, rapidly absorbs and leaves skin feeling replenished. Last but not least we were sent a couple of bottles of Marques De Caceres wine. The Marques de Caceres Verdejo White which is an aromatic white wine from the highly regarded Rueda region, full of character and balanced acidity. Expect nutty, herbaceous and citrus notes, perfect to accompany spicy food or fish. Second we have the Marques de Caceres Blanco White which is a rich and dry white wine. Minerals lace through notes of grapefruit and pear, making this a fresh and crisp feeling wine on the palate. These will go down a storm in the evening once the kids are in bed. Have you bought all your presents for Father's Day or are you running a bit last minute like me? - This post contains PR samples and a sponsored link. I find shopping for men really difficult, both my partner and my Dad buy the things they want anyway! I've managed to get my partner a gift for Father's Day this year, but still struggling for my Dad!